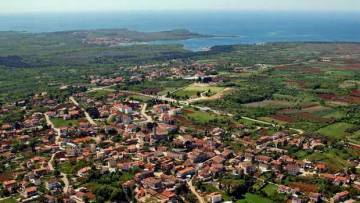 TAR is composed of two settlements, Tar and Vabriga, separated by the main road connecting Poreč and Novigrad. This is a fertile plateau at a height of 112 meters above sea level, which on one side slopes towards the sea, and on the other towards the mouth of the Mirna River. This location offers a spectacular view towards Novigrad in the north and Poreč in the south. On a lear and sunny day you can see the Alps, and from the top of Tar's bell tower even Venice. This region is famed for its exceptional olive oil. FAO experts have declared that the finest olive oil in Europe comes from these very parts, from Larun olive groves below Tar.